Are author pages supposed to have rating modules? Uh, I'll just go with yes. This is my author page. It's kinda weird and meta. As you might be able to tell, I'm not exactly sure where to take it. I'll just plonk down my stuff. Ignore all this awkward white space. Security Clearance: 3 and a half. Handedness: Depends on time of day. Profile: I don't know, I've been making this up on the spot. Why did I get an author avatar? Why did I have to shoehorn them into my first article? I don't know, it seemed right. It wasn't even "Emma Lister" at first, it was Matthew Lister or something like that, y'know, since AA's typically share your gender. Check 2514's history. I actually changed it on a whim, since someone pointed out that her name is a better pun. Ignoring the fact that I pronounce my name rhyming with "blister". Joke's on them, I came to terms with my own gender fluidity recently! Anyway, I have no idea what to do with this character. She's… into horses? She's stationed at Area-12? I don't know, if you have any good ideas, toss them my way. SCP-245: Format screw aside, I do think that this SCP has a compelling and satisfying narrative, and I'm surprised that it isn't leagues more popular. I'm not quite sure how to articulate why I like it, but I do think everyone should give this it a try. SCP-1247: No, I don't care how memey this is. It's an amazing mix of hilarious and horrifying. Even the test logs show how much the author has thought the anomaly through. I wish that 1247 was a more popular character on the site, because I think there's a lot of potential there. SCP-2498: I think this SCP manages to craft an engrossing and beautiful story while keeping the format perfectly intact. It's both beautiful and dreadful, and manages to be very intimate while never straying from the detached framework. It is simply one of the most well written works on the site. SCP-3999: I really can't do this article any justice. Reading it through beginning to end is an amazing and mind twisting experience. If you somehow haven't read it yet, please stop reading this author page, and start reading 3999. SCP-231-J: I'm not sure how this managed to be as gut-busting as it was. I didn't stop laughing at any point in the article. Each section managed to up the ante in a different way, and the ending did not overstay its welcome. SCP-8900-EX: When I first read the article, I wasn't sure what to think of it. The more I think about it, though, the more I love the central conceit. The Foundation lost, and the Foundation has to live with it. The sense of pathos the final notes gives me just hasn't been replicated by any other article on site. The Broken Fifth: Real hidden gem if you ask me. I enjoyed every second of reading through it. The prose is smooth, each word makes me want to read more, and the imagery pops out at you. It's a light read that I recommend everyone check out. Mission Statement: Quite possibly my favorite Tale on the site. It's an expertly crafted master piece that holds your attention from beginning to end. It deconstructs the Foundation, and makes you question everything about the its mission. Miss Heir: This article was one of the inspirations for my own 2514. It's a captivating story that really manages to provide new character to the Wondertainment saga. I absolutely adored the way that the format was messed with in order to reinforce the narrative. Memetics and Infohazards Division Orientation: Embodies just about everything I love about the format screw. It's both a tale and a puzzle (a finished one! ), and unravelling the layers of the text had me grinning the entire time I read. Until Death: If I had to suffer through this, y'all should have to suffer through this. If you really want to know, pester me on IRC or something. SCP-2514: The one that started it all… to put it in dramatic terms. The idea came from mf99k's SCP Cliche Generator. Looking at the source code, I think the prompt was something like "A cognitohazardous horse that raises the dead. Also, Dr. Wondertainment made it." The idea ingrained itself into my head. What would would drive Wondertainment to commit necromancy? How could reviving the dead fit into the "make kids happy" paradigm? I didn't have a wiki account at this point, and my desire to write this article was one of the factors that lead to me finally joining the site. The Dr. Isabel connection and Tragic Backstory™ were actually later developments in the creative process, even if isn't evident in the article itself. The concept might be a bit convoluted, and the execution could be punchier, but I'm ultimately proud of it. 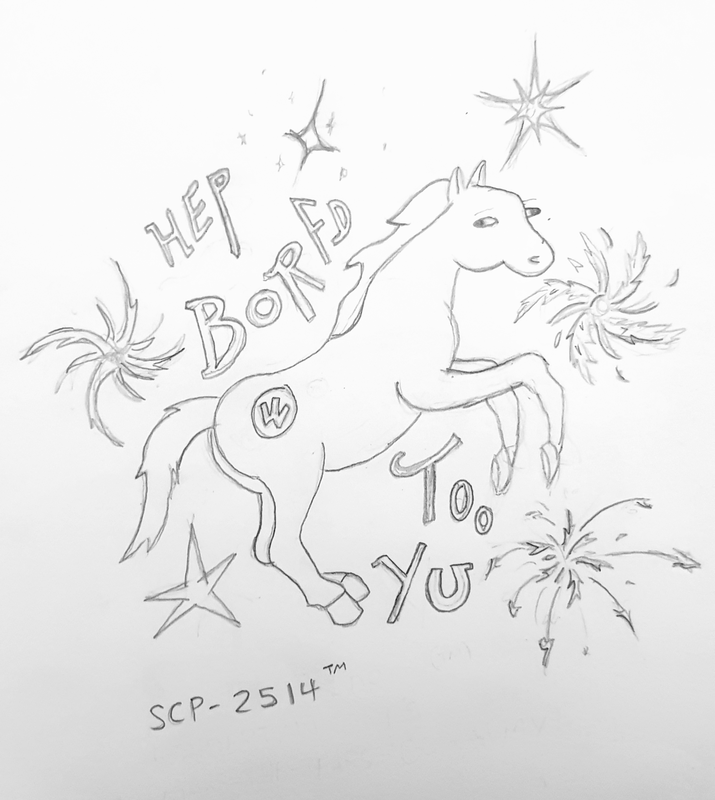 SCP-173-D: I'm not going to lie, I wrote this one entirely off of the name. The whole "173 is nothing special, why is it so important?" narrative popped into my head as I began writing. Mind you, it took me several tries to get it down. I remember grappling with myself over the length and paragraphing the entire time, for example. Ultimately, there's strong points (New Guard SRA vs. Old Guard 173 symbolism), and weak points (the "bulbous visage" line), but I do think the final product works. Grease: Grease, grease, grease. My most controversial piece, though I have no idea why, standing at a mere +1 after exactly two weeks. Ironically, this one might also be the one nearest and dearest to me. I wrote it for an off-site halloween contest, and the bulk of it was written the day before I had to turn it in. I, uh, didn't win, for reference. Anyway, as I was saying, this Tale is close to my heart. I, uh, actually have no idea if I have OCD or anything like that (self-diagnosing seems like a horrible idea), but the faceless protagonist does match up with me. I do shower three times a day, I do wash my hands and face more than I have to or should. I do have agoraphobic tendencies. I find it really hard to separate this piece from myself, which is why I've been so… moody about its reception. SCP-475: I'm also not going to lie on this. I rewrote this article entirely because I wanted a S1 spot. This was my best option, since it had a workable concept (soap that did magic stuff when used by someone religious) and it wasn't in immediate danger of deletion, while being old enough and low enough that the Rewrite Team would give me a shot at it. Heck, I had a draft ready when I contacted WJS to actually reserve it. My portion of the work came mostly from the test log, which was honestly an excuse to show off my knowledge of site lore. My original draft for this was kinda barebones, and Tarage had to steer me to something with an actual emotional core. We had a collective writer's block that lasted for months, but the article finally found its place on the mainlist. This author page: I learning as I'm going, bear with me please. SCP-3615: This one languished in my sandbox– multiple sandboxes actually– so long that all the details are fuzzy in my mind. I think the central emotion from the start was sympathy, pity. It was a piece on how being a god sucked, about how having your existence defined by others perceptions of you was painful, physically painful in this case, and that's without touching the identity crises. Then, it became more visceral, it was a Cancer of Passion level attempt to force sympathy from the reader. Ba'al was the candidate for this from about the start, with me being inspired by Shin Megami Tensei: Devil Survivor (shoutout to Kinch for getting the reference). I went on a research trip to… wikipedia, where I learned about the dozens of gods who were titled "Baal", and that's how the article got bloated with anomalous effects. Anomalous effects that I spent a good while tweaking so that they both fit in, and were pitiably sad or perverted. I also tried writing a Sight-See Lux log to complement the first interview, but couldn't make the voice work. Then, it got a neo-paganism bent, as I realized that I needed an interview from the people who actually built the thing. As I wrote the last interview and tightened the first one, my head was kinda swimming with ideas. To give a short run down, the themes of the final product are supposed to be: cultural appropriation, anti-theism, religion-based bigotry, hypocrisy, and societal expectations. I'm not really sure how I managed to squeeze all that in there, or even how evident it is from the text, but I'm proud of the final product. The Thing at the Bottom of My Dreams: This one actually came to me in a dream, I think. If not a dream, a bit of imagery that came to me early in the morning. A massive beast lurking at the bottom of a deep dark well, the dream, its serpentine body coiling around itself as it waits. I had half-hearted thoughts of making an article out of it, but nothing concrete. I knew that the serpent would be Ananteshesha. I came up with the twist that the serpent was protecting our protagonist from an apocalypse. My initial thought would by MK, some very loose ties to qntm's series. Then Doomcon came around, and I pitched the idea in the vaguest of terms to my team mates, and realized that our scenario was perfect for dumping my headcanons onto a hapless wiki. The kind of connective and extensively thought-out headcanons I considered putting on a forum post somewhere, or on this very author page. The actual building of the tale was haphazard. If I wanted to show the ongoing apocalypse, I needed day portions for each night. 'Course, the apocalypse is vague, so I have it as a "things get real" surprise at the penultimate hour. The ASCII image is something I thought would be cool, and then found myself invested in as I struggled to implement it. The white text was done because I thought was appropriate, and then because it was symbolic. The use of collapsibles was inspired by The Flytrap (even though I kinda have mixed feelings on it). SCP-3461: I think this is just another idea I had to, get out of my constipated brain. I think. It's been a while since I wrote it. Anyway, I think this is a digression on the big bad evil Foundation. The more I thought about the nature of the Foundationverse as it was made more anomalous by the continual creation of SCP entries, the more arbitrary the Foundation was. Several 001's have explored this idea in detail (hence Shaggy saying this could have been an 001). I guess my approach to it was less so question the retroactive arbitrarity of the dividing line and more so why it would have existed in the first place. I think I circled back around to addressing Tanhony's proposal: the Foundation exists to do good. Security, protection, and containment are a means to the end, not an end onto themselves. Thus, when you task the most powerful group in the world with doing something that can be described as "the ultimate good", you end up with a bunch of would-be-gods trying their hand at an all-inclusive paradise. Low Earth Orbit Divinity: If you aren't in the know with the community (but somehow managed to stumble upon and get this deep in my author page), I'll let you in something: Rigen is a serial downvoter. This isn't an accusation or anything, it's just an objective fact that places him among the likes of Kalinin and Psul, only he's less so the critiquing sort. This meant that I had my work cut out for me. I was given my giftee because I upvoted one 4916. Honestly, the original had this imagery in it that I felt under-tapped. So I set about to do just that. Turns out a single image an article be not. So from there it was an exercise in padding. I found an ancient text on Ninurta, saw in it a good story arc… after I rearranged and selectively cut a few sections. The AAPA theme was originally there just for looks, but thankfully I was able to integrate it in a more meaningful way. The satellite pictures are the results of hours of trawling wikimedia commons. I thought they were too atmospheric not to use. Frankly, for something that was cobbled together around imagery that was ultimately delegated to a tiny, weak section of the final piece, I really am proud of this one. In no particular (or is it?) order, here are some SCP artists that I think you should check out and support. Please don't look too closely. Mary Ann X Salah: Let's start with a simple one. Their relationship throughout the entire series was cute, and while the marriage proposal could have been developed more, it's refreshing to see a couple that actually evolves through the work. Rakmou-leusan x SCP-3125: Ninevolt forced me to put this here. What do you mean Scantron already did this joke? 1. Seriously, she made this, go shower her with some attention. 2. In hindsight, this line is disgustingly prophetic. 3. I probably should have told you that links are invisible earlier. 4. Well, they used to be.